But I wonder if all our American and European flute teachers know about these method books? 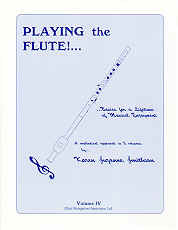 You can view all six books here at the Catalogue page of Weisgarber publishing, or you can look them up at Fluteworld. 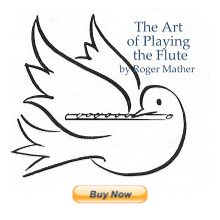 This flute method series seems to be very comprehensive in their pedagogy and each volume only costs about $15 U.S. The sequential five volumes go from complete beginner to advanced high school flute playing. There are work pages of music theory basics, and clear and concise practise suggestions. Major scales (with sharps) and how to create the scales yourself using tetrachords. Sixteenth notes. Volume IV: - Staccato - Syncopation - Portato - Minor Scales - Appogiaturas - Grace notes - Trills. Cadenzas - Modal/Pentatonic/Dim and Whole tone scales. Now; read on for the musical material, which is the complete and utter BONUS!!!! The Karen Smithson "Playing the Flute" method books also has a separate piano accompaniments volume (140 pgs. in score form $22 U.S.) contains folktunes and celtic tunes of all kinds, and almost an equal number of famous 'classical' pieces, many of which are famous and well-loved symphonic repertoire. All the pieces are fairly short and the piano accompaniments for the series of five workbooks contains all the recital flute pieces in progressive order. There are just so many great tunes for young players all in one book series. All the Celtic and folk tune titles are listed on my webpage, if you click here. The folk tunes have lovely simple but effective arrangements for flute and piano. Holst - Theme from "The Planets"
"Piano Accompaniments" (in score form in piano book, full size flute parts in flute books) is the one single volume you'll definitely want if only purchasing one book to start. Hope you get as much pleasure out of these method books as I do. If you'd like to sell your Taff/Gaubert hardcover, it's likely worth $40-$60 or so, depending on its condition. If it's in poor condition (ink, dirt, cover falling off) then you still might get $30 for it from an interested flute teacher or student. - one of the flute discussion groups (give your location to find local teachers). FLUTElist at www.larrykrantz and Flutenet and Galway Flutechat at Yahoo groups all allow one time sale announcements when you join to post an item for sale.